As promised in my earlier post of Dr.G's Water Holding Essence, I will write about my experience of using The Body Shop Carrot Moisture Cream. I was told that the cream is an old favourite, originally launched in 1980. It was not available for a while and is back again after big demands for it. So I thought, hmmm, worth a try! Hydrate and protect your skin with a rich, moisturizing, non-greasy daily moisture cream that leaves the skin feeling beautifully soft and supple. Best for all skin types. However upon application, it feels more hydrating than moisturizing (which is what I am looking for). It make lighter application than how it looks. It did not make my skin feels smoother, but does make my skin feel more hydrated. Skin does feel hydrated although not as much as Dr.G's. It feels a little oily after application, but still as I said, more hydrating than moisturizing. It does not have the smell of carrots, but smells a lot like a regular cream. I personally do not like the smell. I only need to use very little for the whole face. I put a dot on each part of my face eg. forehead. cheeks, nose, chin. It comes in a 50ml tub with the price of ZAR90 (Which is around RM39 after conversion). If i Google for reviews of this item, a lot of people are raving about it. It might be just me who has set a very high baseline after using Dr.G's Water Holding Essence. 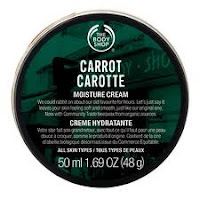 The Carrot Moisture Cream is good for me in the meantime while I do not have any other hydrating products. Overall, I will not buy this again but instead try another brand of hydrating cream.